It is generally accepted that there is a correlation between higher levels of education and better career opportunities. But just how much of an advantage does postgraduate study provide compared to a bachelor’s degree qualification? According to PayScale, an online salary comparison website, the pay gap between bachelor’s and master’s degree holders can be pretty significant if you are in the business and information technology (IT) industries. For example, employees with a master’s degree in business administration (MBA) in business and marketing, and with five to nine years of working experience were found to earn roughly 2.6 times more than business and marketing bachelor’s degree holders with similar years of experience. Meanwhile, master’s degree holders in IT with five to nine years working experience were found to make nearly 1.4 times more than IT bachelor’s degree holders with similar years of working experience. 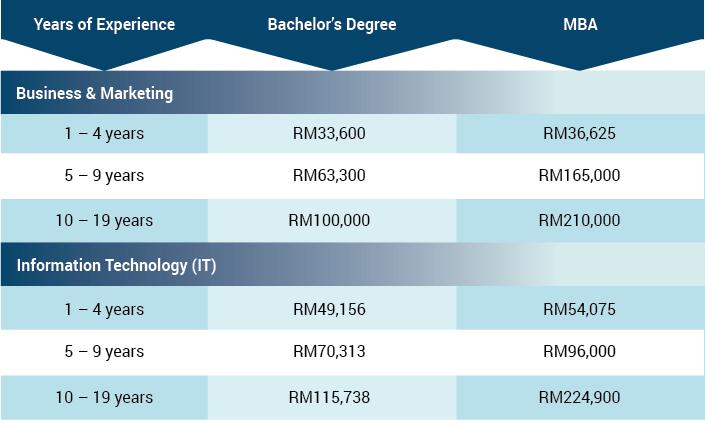 Below is a detailed comparison of the average annual salary difference between employees with a bachelor’s degree and those with a master’s degree in business and IT-related fields. The disparity in wages between master’s and bachelor’s degree holders grows with increasing years of working experience. This could be attributed to employer perception that a postgraduate degree qualification is an indicator of an employee’s capability and character, such as being hardworking, intelligent and responsible, and hence, these employees are paid accordingly. Many employers also expect those who are armed with postgraduate qualification to have at least five to eight years of working experience. These standards are reinforced through the vigorous admissions standards of reputable postgraduate programmes, where those applying must have some working experience, preferably with at least a year in management-level positions. The number of employees with tertiary education rose by 46% in Malaysia between 2007 and 2012, largely due to new entrants of whom many are fresh graduates. Having a postgraduate certificate such as a master’s degree or higher can give you leverage and help you stand out over those with a bachelor’s degree. As more and more people expand their education, the competition for high-paying decent jobs will increase. Experience combined with higher education helps demonstrate motivation and drive to succeed, qualities that employers seek out. Postgraduate study helps you build on skills acquired at undergraduate degree level and the workplace, including time-management, problem-solving and decision-making abilities, people management and strategic thinking. You also develop a new form of maturity, now that you are no longer working on a student-teacher dynamic, but as a group of similarly-qualified researchers in a field. This creates a sense of leadership and confidence that will enable you to navigate the workplace as a polished professional rather than just a graduate. Such abilities will no doubt be integral on your ascend on the corporate ladder. Among the biggest benefits of going back to school is it helps you build a network of experts in the same field. Many professional jobs and career opportunities are found by networking. Also, many schools emphasise on creating their own society, so that alumni remain committed to lending a hand to their younger peers and often help them with introductions, mentorship and referrals. Getting a referral from someone in the company is one of the best ways to have your resume read, score an interview, and ultimately, get the job. In a study, researchers from the Federal Reserve Bank of New York and MIT found that referrals account for between 30% and 50% of job hires in the United States. It also found that a referral who gets an interview has a 40% higher chance of getting hired than other candidates. Besides specialising, opting for postgraduate study can boost and create new career options that will set you on the path of new and exciting goals. For example, if you have a bachelor’s degree in Fine Arts, but are hoping to venture into marketing with no prior experience or related education, a MBA is the surest way to make that switch. The diversification and training you will experience with postgraduate study can open up new employment opportunities that were not there before or help you develop new skills that can enhance your earning potential. Going back to school can quickly add value to your resume and make you richer in the long run. However, postgraduate packages do not come for cheap. Tuition fees for postgraduate courses can go up to RM65,000 at some private institutions in Malaysia. The steep price of higher education, coupled with the rising costs of living means that many working adults may not be able to afford to take up more advanced qualifications or courses. Also, a master’s qualification may not be helpful for all occupations. The risk with getting a postgraduate qualification for positions that do not require them is that you might be considered “overqualified” for some employers and are thus turned down for jobs. In this case, you might need to dumb down your resume or brand your degree when applying for certain positions if you can’t find employment in your chosen field of profession. The pursuit of any form of education to enhance career prospects does not always guarantee immediate or exponential success, but by engaging with the opportunities available, going back to school can prove to be a worthy investment.